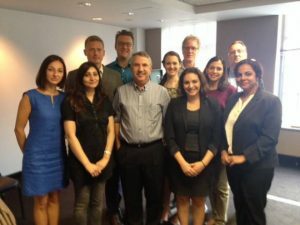 2014 WPI journalists meet with columnist Thomas Friedman at the Washington bureau of the New York Times on September 3. The World Press Institute fosters understanding among international journalists about the role and responsibilities of a free press in a democracy and promotes excellence in journalism. Through its fellowship program, WPI brings 10 international journalists to the United States each year to experience the complexities of U.S. life through the prism of a reporter working under First Amendment conditions. The fellowship provides immersion into the governance, politics, business, media, journalistic ethics and culture of the U.S. through a demanding schedule of study, travel and interviews throughout the country. Media coverage of the WPI 50th event, interviews with WPI fellows who returned for the event, and speeches by Jim Fallows and Kelly McEvers.